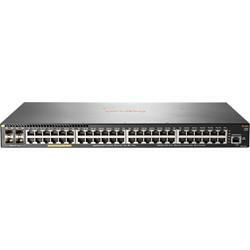 Designed for the digital workplace, the Aruba 2540 Switch Series is optimized for mobile users. With advanced security and network management tools - Aruba ClearPass Policy Manager and Aruba AirWave - this layer-2 access switch is easy to deploy and manage. With support from cloud-based Aruba Central, you can quickly set up remote branch sites with little or no IT help. Enhanced access security, ACLs, traffic prioritization, sFlow, and IPv6 host support. Speed remote deployment with Aruba Central. Consistent wired and wireless experience with Aruba ClearPass Policy Manager and AirWave Network Management.